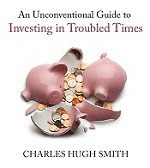 oftwominds-Charles Hugh Smith: Is This How the Next Global Financial Meltdown Will Unfold? In effect, a currency crisis is simply the abrupt revaluation of the currency to reflect new realities. This creates a problem for the central banks that have orchestrated the "recovery" by goosing asset bubbles in stocks, real estate and bonds: unlike these markets, the currency-FX market is too big for even the Federal Reserve to manipulate for long. Currencies are in the midst of multi-year revaluations that will destabilize the tottering towers of debt, leverage and risk that have propped up global growth since 2009. 1. Capital flows into and out of the currency (and the nation that issues the currency). 2. Perceived risk, specifically, will this currency preserve my global purchasing power (i.e. capital) or erode it? 3. The yield or interest rate paid on bonds denominated in this currency. 4. The scarcity or over-abundance of the currency. If we dig even deeper, we find that currencies reflect the income streams and assets of the issuing nation. Consider the currency of an oil exporting nation that has seen both its income from selling oil and the underlying value of its oil in the ground fall by more than 50%. Why shouldn't that nation's currency decline in parallel with the erosion of income and asset valuation? As a nation's income and asset base decline, there is less national income to pay interest on sovereign bonds, less private income to tax, and a reduced asset base for additional borrowing. This is especially true if the nation issued debt and/or currency profligately in good times. Recall that debt and currency are one in the same: if someone trades euros for a U.S. Treasury bond, they don't just own a bit of sovereign debt--they own the currency of the nation that issued the bond (in this case, the U.S. dollar). This is equally true of corporate bonds--all the debt is denominated in a specific currency, and owners of the bonds are not just betting that the interest will be paid and the bond redeemed at maturity, but that the underlying currency will not lose much of its global purchasing power. One proxy for the absolute destruction of commodity-based income streams and assets is the CRB Index. No wonder emerging economies that depend heavily on the export of commodities are cratering, along with the currencies they issue. Once participants become aware of the rising risk of holding a depreciating currency, the trickle out of a currency quickly becomes a torrent of fleeing capital. Once the perceived risk switches from risk-on to risk-off, the only way to prop up the currency is to raise the interest rates that bonds denominated in that currency yield. But raising interest rates has a brutally negative effect on the domestic economy, as higher rates choke off domestic lending, which then pushes the economy into recession. It's a no-win double bind, though, for doing nothing and letting one's currency implode drains the nation of capital and makes imports unaffordable. That matters when the imports are energy and/or food. When those become scarce and unaffordable, social disorder soon follows. Though that crisis was linked to Thailand's failed bid to support its currency's peg to the U.S. dollar, the current situation is actually far more fragile as the destruction of commodity income and valuation raises the risk of sovereign defaults, corporate bond defaults, and capital flight that deepens already severe emerging-market recessions. The bone-dry half-dead forest awaiting an igniting lightning strike is the global mountain of debt--debt which is no longer supported by current valuations of commodities and risk. In effect, a currency crisis is simply the abrupt revaluation of the currency to reflect new realities. That revaluation then raises the risk premium on debt denominated in that currency or owed in other currencies. As emerging market currencies decline, the income streams needed to service all the debt denominated in U.S. dollars declines, a self-reinforcing dynamic: as income and valuations fall, capital flees, pushing the relative value of the currency down even more, which further raises the risk premium that then triggers even more capital flight. The sums in play are so staggering (an estimated $11 trillion in emerging market debts denominated in other currencies) that even the Fed won't be able to stop the meltdown. Last three days to get a 25% discount on my new book A Radically Beneficial World: Automation, Technology and Creating Jobs for All: The Future Belongs to Work That Is Meaningful. The print edition is $25, but there's a $10 discount this week through my publisher's page for the book: you must use the code TL6PDA4D to get the $10 discount. 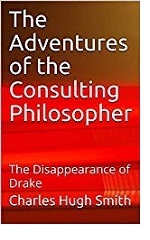 Note this does not include shipping, and requires making the purchase through Createspace. Thank you, James S. ($50), for your superbly generous contribution to this site -- I am greatly honored by your steadfast support and readership. Thank you, Anthony S. ($5/month), for your outstandingly generous subscription to this site -- I am greatly honored by your steadfast support and readership.